The CMAR HYBRE 2000-6 is the first street care vehicle of its kind. Pioneering CMAR has initiated deployment of hybrids in this segment, winning itself the 2013 Prize for Innovation at the Mayor and Local Authority trade show. Electric mode guarantees noise comfort in city centres, then the hybrid mode limits CO2 emissions and guarantees the protection of the environment. For cleaning and scouring activities, the vehicle is driven by an internal combustion engine; the engine is at low speed (900 rpm) thereby guaranteeing minimum noise. The cleaning bar is driven by an electric motor. For static work,with the vehicle stopped, the machine is in 100% electric mode. Electricity autonomy is about 3 hours. When working in hybrid mode, an alternator built into the machine continuously recharges the battery: work time is therefore unlimited. 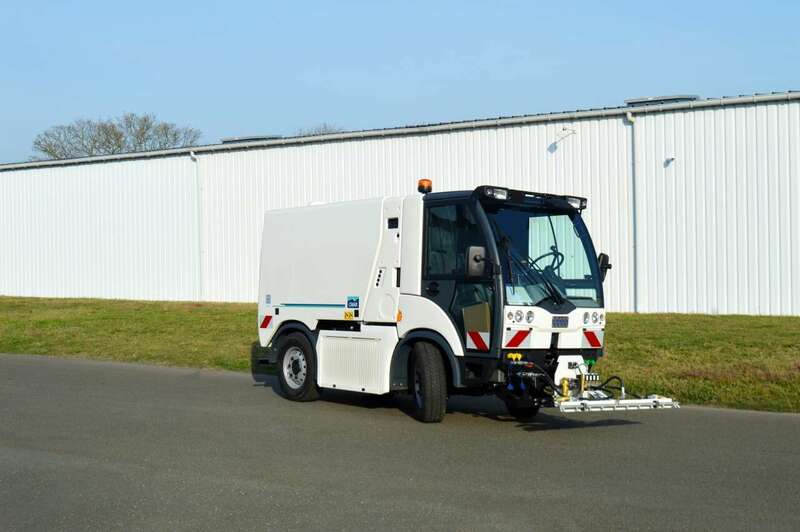 This hydrostatically driven compact CMAR LHYBRE carrier with its 4-wheel drive and directional wheels is the new generation of street cleaners. Its 1500 litre reinforced polyester tank gives it maximum working autonomy. Fitted with a telescopic cleaning bar from 1.20 m to 2.50 m and operating pressure of up to 80 bars, the CMAR pavement cleaner meets all the requirements for urban cleaning. Its 360° directional cleaning arm with built-in automatic winder allows it to pass under store awnings and through portals. The 2 fishtail type side sprays make it possible to clean under cars. The LHYBRE 2000-6s key points are silence and reduced operating costs. Back Adjustable telescopic shock absorbers at the front and back.